Templates and themes are a common feature in any presentation application. Both desktop and online ones allow you to create presentations with templates. Impress is no different. This page gives an overview of templates and shows you how to quickly apply them to an Impress document. The different ways to do this are the same regardless of what operating system Impress is running on. However, different versions of LibreOffice have different features. Starting with version 5.2, the Template Manager has been updated, and versions 5.3 and later, no longer have the Presentation wizard. The page covers these differences. There are several ways to apply a template to a new document. It can be done during the creation of the process of a document or right after the document is created. There are two types of guides that can be used when you click Presentation under the New sub-menu or Impress Presentation in the Start Center. They are Select a Template and the Presentation Wizard. 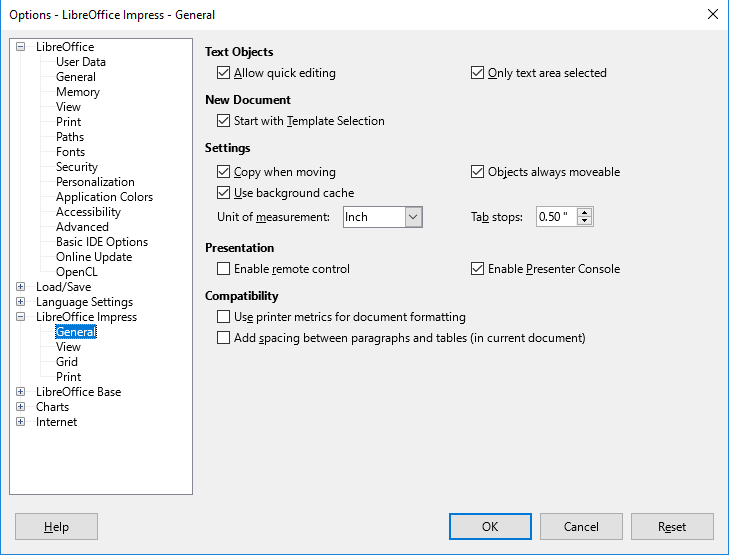 Many times Impress is set by default to open the Select a Template window. As mentioned earlier this is available in version 5.3 and later. This is almost identical to the Template Manager window that will be discussed briefly in the “After new document is created” section. It, however, lacks a few of its features. When a new presentation is created, the window appears on top of the new document. It requires you to cancel it or apply a template before the new document can be edited. Click the drop-down menu in the far right and select a desired category. Scroll up and down until you find the desired template. Either double click it or click it, then click the Open button. You also can create a New Category, rename a category, and delete a category. If you are using Windows or a Linux distro, click the Tools menu. Mac users, click the LibreOffice menu. Windows and Linux users can click Options in the Tool menu. For Mac users, the item is Preferences. This opens the Options window. In the Options window, click the plus sign or arrow next to LibreOffice Impress. Under the New Document section, put a check in the “Start with Template Selection” check box. The next time you create a presentation, the Select a Template will appear on top of the new presentation. For version 5.2 and older, there is a wizard. It has a detailed setup process that allows you to set the background colors, the output medium, and the transition style. 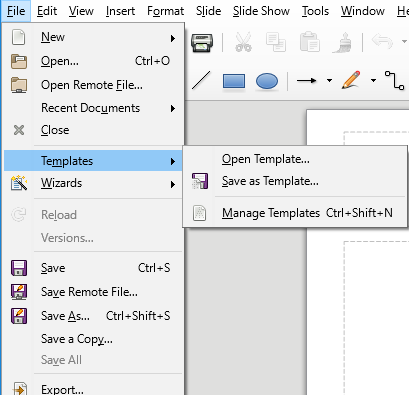 The wizard can be launched from a newly created presentation or any other type of document. Click the Tools menu, if you are using Windows or a Linux distro. For Mac users, click the LibreOffice menu. Windows and Linux distro users, click the Options item. For Mac it will be Preferences. This launches the Options window, which has settings for Impress and the suite as a whole. Click the arrow to the left LibreOffice Impress in the left column. Click on the General item. Under the New Document section, put a check in the Start with Wizard box. The next time you create a presentation, the Presentation wizard will appear. You can ignore the Select a Template window, or if you disabled it for the creation of a new document and you go to a blank presentation, you can apply a template after the document has been created. This opens a window that lets you search your computer’s directory for a template that you have downloaded or created. It is similar to opening a document on your computer. NOTE: This item is not available in version 5.1 and earlier. If you are using one of these versions. 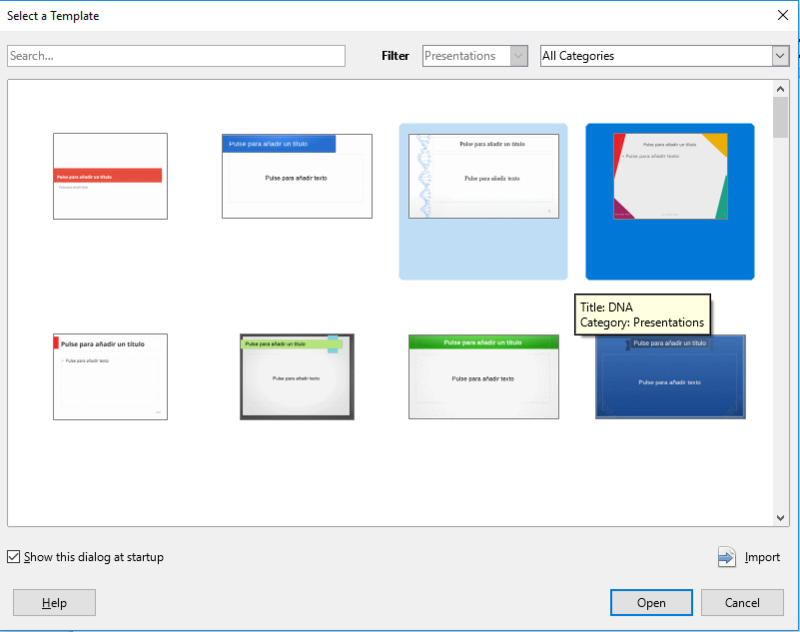 Templates can be downloaded from the Extensions and Templates Website for LibreOffice. This allows you to save the presentation – its background colors, font styles, and other formats – as a template to be reused. This item opens the Template window. It is similar to the Select a Template window that was discussed in the previous section. With version 5.2, the Template Manager was redesigned. It allows you to change the choice in the Filter drop-down menu. It also has a Settings icon and a Browse online templates icon that links to your default Web browser and goes to the Extensions and Templates Website for LibreOffice.